Creamy, rich, savory and just a touch of natural sweet from the shallots. 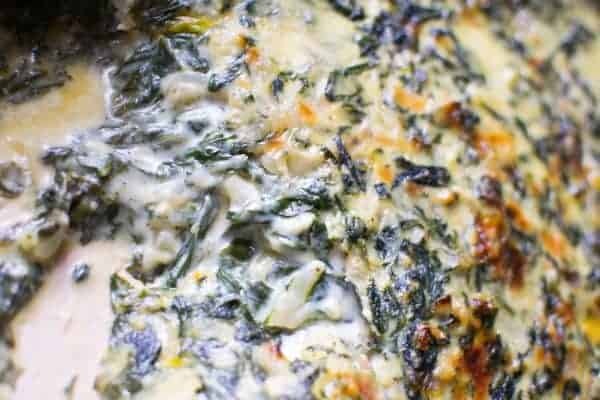 Rainbow Chard & Shallot Gratin is the vegetable dish you’re family will ask for this holiday season. Bonus: it’s got lots of leafy greens. It doesn’t take much to get me excited about food. You’re shocked, I know. Talking about flavors, texture, combinations I could literally talk all day. Short side bar to highlight this point: recently I started bartending two nights a week, during one of my closing shifts I proceeded to talk to my late night guest about how much I love bread – the science of the chemistry of baking, the smell of fresh bread in the oven, and how I kind of wish that was a car jar scent – it was probably (probably?) bordering on weird before I reigned myself in. It’s true, it doesn’t take much, but occasionally food gets a little boring when you’re in a vegetable rut. Lately, it’s been a lot of the same on our dinner plates – sweet potatoes, green beans, butternut squash, Brussels sprouts – a full offering of fall flavors, but recipes I’ve made countless times. Well, that rut has come to an abrupt end. 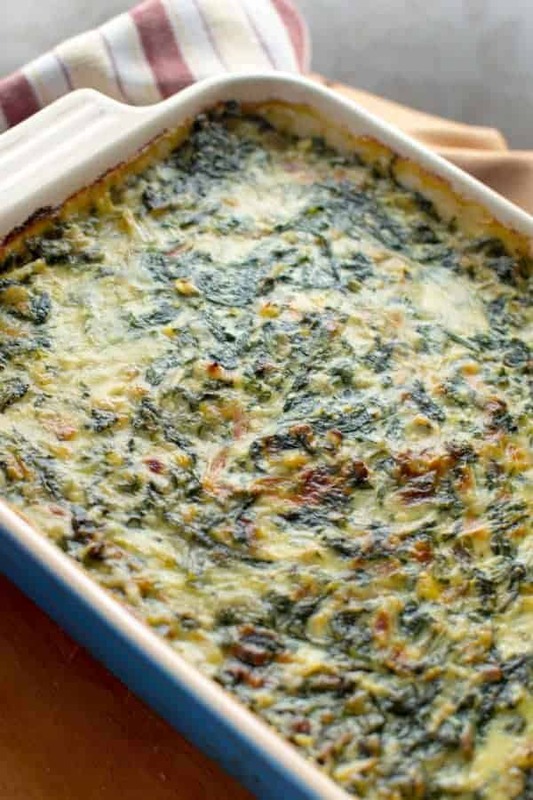 Whatever boring vegetable you were planning on dishing out at Thanksgiving, push it off the imaginary table in your head and serve Rainbow Chard + Shallot Gratin instead. 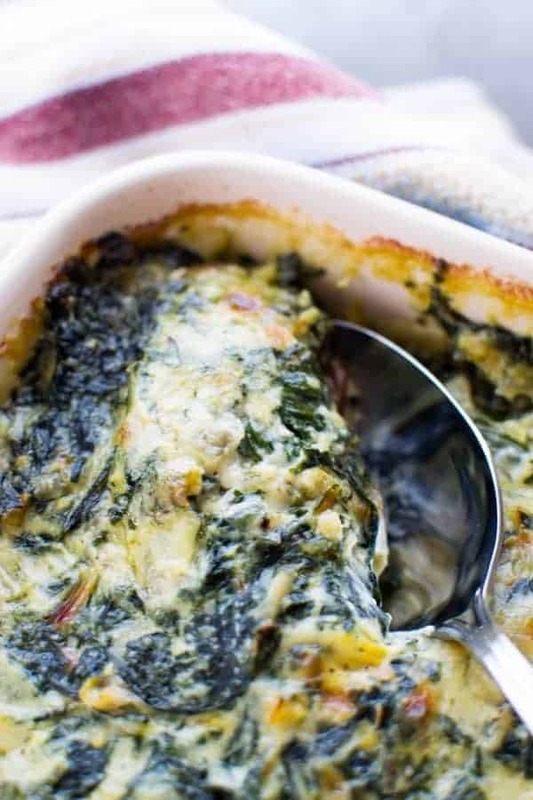 Rainbow Chard & Shallot Gratin. It blew my mind. 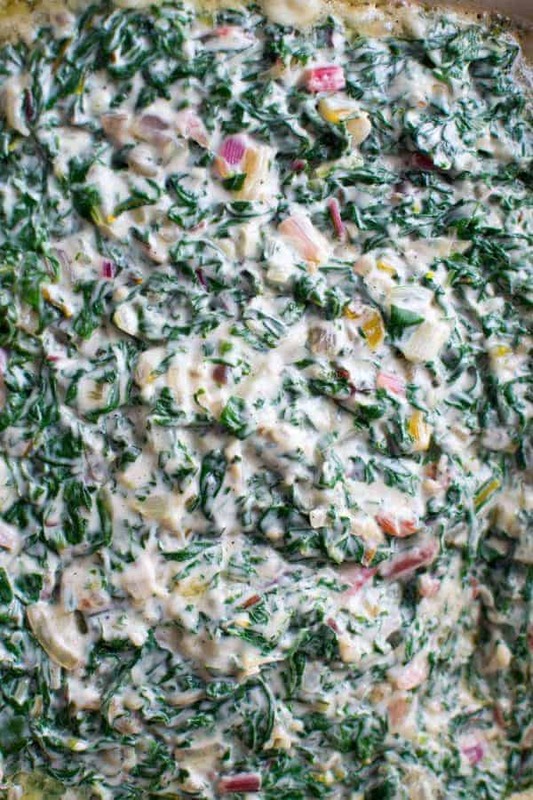 Tender rainbow chard, sweet yet savory shallots, all baked up in a creamy cheesy sauce. 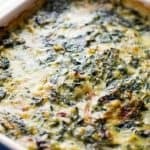 If you are a fan of creamed spinach but need more vegetable crunch or love potatoes au gratin but feel weighed down from all the starch, this is sure to make your tastebuds and your belly happy. Now, full disclosure, it’s not going to be the healthiest recipe posted on HungerThirstPlay, but from what I’m told there are no calories on Thanksgiving…so there’s that. Recommended to be served as a side dish, this recipe goes a long way so it’s perfect for Turkey Day. If making for two-to-four people and serving alongside other dishes, the recipe can certainly be halved. 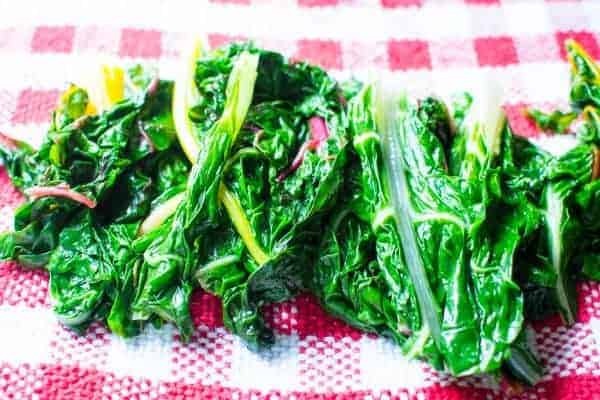 At first look six bunches of rainbow chard are going to take up a daunting amount of counter space, but after blanching and shocking and squeezing the ever-loving daylights out of them you’re going to wonder where they all went. Set up your blanching and shocking station first with a large pot of boiling water and a large bowl with ice and water. 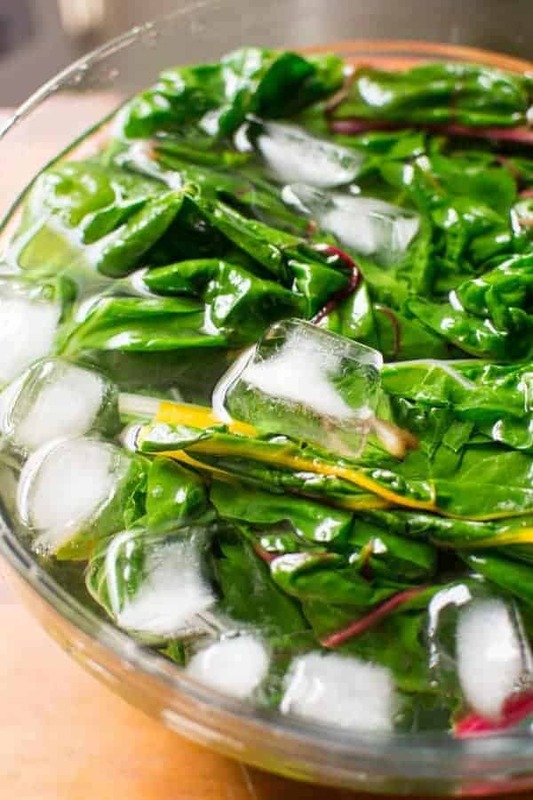 Trim any large stems from the rainbow chard and when the water gets to a rolling boil, blanch the rainbow chard for 1 minute until wilted and then transfer to the ice bath. You probably won’t be able to fit all that chard in the pot at the same time, so you can do this in batches. Use absorbent kitchen towels to wring out as much water as possible. Before baking, the gratin will be a white creamy sauce blended with beautiful green and rainbow colors from the chard. After baking, the sauce with turn slightly golden and develop a beautiful golden brown on top. Scoop and enjoy! Trim any large stems off the chard and cut bunches in half. In a pot of boiling water, blanch rainbow chard in batches, cooking until wilted – about 1 minute. Transfer to an ice bath immediately. Continue process until all the rainbow chard is blanched. Following the ice bath, squeeze the chard thoroughly to dry and chop it. In a large pot, heat the extra virgin olive oil on medium-low heat, add the shallots and season with salt. Stir with a wooden spoon or spatula during the cooking process to ensure the shallots do not burn, about 2 minutes. Add the rainbow chard to the shallots, season with salt and stir to combine, remove from the heat. Butter a large baking dish (10×15-inch recommended) and preheat the oven to 425F. In a large saucepan, melt the butter. Once butter is melted, stir in the flour over medium heat to form a roux. Texture will be like a thick paste. Gradually pour in 1/3 of milk, whisking continuously to remove any clumps while mixture thickens. Repeat a second and third time until all the milk is incorporated and mixture is smooth. Continue whisking until sauce begins to boil. Reduce heat to low and cook about 15 minutes, occasionally whisking the sauce. The sauce should be thick and creamy, any flour taste should cook off at this point. Whisk in the cheese and nutmeg, add salt and pepper to taste. Combing the sauce with the chard and shallots, season again with salt and pepper. Transfer the rainbow chard and shallot mixture to the baking dish. Bake in the upper third of the oven for about 25 to 30 minutes, until bubbling and top is golden brown. Allow to rest 8 to 10 minutes before serving. oh. my. yum! I’m hosting Easter this year (no pressure!) and I have NOOO idea what to make. thank you SO much for sharing this because I’m trying to add veggies in most dishes because we totally don’t get enough vegetables in this house. My family is way over spinach and kale – i’ve never cooked with chard, so I’ll try this in a few days before I make a big batch! yum! I hope you love it, we definitely do! It’s become a staple at our family holiday dinners. How can you not love vegetables baking in creamy, cheesy goodness? haha. Looks and sounds delicious! I love rainbow chard too…so pretty! This looks so delicious – I’ve given up starches so I’ve really been missing my potato gratin! This looks like an amazing replacement! Ill have to try it this weekend! This sounds wonderful! 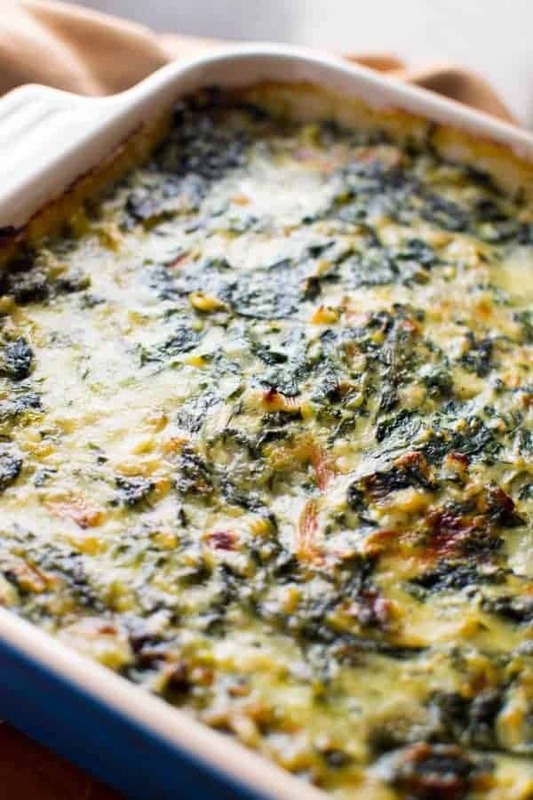 I love chard as an alternative to spinach and you cannot go wrong with a gratin! That looks amazing! I love chard, have since I first had it from a farm stand as a kid! That’s absolutely true!! Haha. It takes up so much space in the refrigerator and then it fits in a tupperware container! 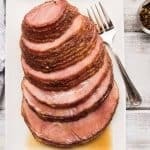 Making this dish to accompany my Easter ham. Wish me luck!